Here you can read online, download or order brochures about the Zurich Oberland. The compact leisure guide of the Zurich Oberland: hotels, restaurants, sport, culture and adventures. A collection of attractive trips for your next company, group or school excursion in the Zurich Oberland. The brochure is currently unavailable. natürliland connects hikes and experiences from culture, education, agriculture, catering and tourism. Visit the Fischingen monastery, the Martin's chapel at Oberwangen, the cruciform church and the St. Mary's church in Dussnang on a tour. Three signposted courses starting and finishing at Gyrenbad. Nostalgia at the Zurich Oberland. Car (56km) and motor bike route (88km) with fantastic viewpoints, excursion options, catering facilities and accommodation. 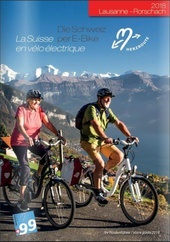 E-biking and pleasure biking across Switzerland in one hand. The Heart Route Guide informs about routes, catering facilities and accommodation from Lausanne to Rorschach. Hiking in the Pine Cone Country. Suggested hikes in the pine cone country around Fischingen. Hiking Map Sunny Land Oberland. The summer panorama and hiking map shows an overview of the touristic highlights and hiking routes from Sternenberg to the Atzmännig mountain. Map, tips and specialities of the Goldingen Valley. The leisure map with many hiking and bike trails from the Linth Area to the Goldingen Valley and the Zurich Oberland. Hiking suggestions, geology trail and Spatz Männi adventure trail at the Atzmännig mountain. Toboggan run, rope park, birds of prey show, leisure park and Spatz Männi adventure trail. Readymade public transport round trips for the summer season, unknown to many Zurich local people. Hike and Bike in the Active 'Thurbo' Area. Attractive hike and bike tours in the fascinating Lake of Constance-Rhine area. One pass for the public baths in Bubikon, Egg, Fischenthal, Gossau, Grüningen, Hinwil, Pfäffikon, Turbenthal, Uster, Wald, Steg and Wetzikon. Timetable of the Zurich Oberland steam train. Timetable and information about the Zurich Oberland steam train between Hinwil and Bauma. The oldest screw steamer in Switzerland on the Greifensee. Industrial history and nature at the Kempt Valley. Discover the beauty of the drumlin landscape on foot or by bike. Grüningen, the idyllic city in the Zurich Oberland is located in the middle of a varied landscape with hills, forests, ravines and ponds. Discover the pearl at the lake. Hiking paths and excursion destinations in and around Sternenberg, map included. Training at the 9 hole golf range in the Zurich Oberland. Alternative hiking routes around the Greifensee. Recreation for People and Nature. Overview of the nature reserves around the Greifensee. Winter Sports at the Zurich Oberland. The slopes are ready for you at the Zurich Oberland. Get an overview of the various offers of the area through maps, pictures, short descriptions and the info line. Panoramic Cross-Country Trail at the Bachtel Mountain. Discover some of the most beautiful viewpoints of the Zurich Oberland on 30 km classic cross-country trails and 15 km skating trails. Fairy-tale snowshoe hike at Gyrenbad. Winter Map Sunny Land - Oberland. The winter panorama map shows all ski lifts, slopes, snowshoe trails, sledge hills and restaurants from Sternenberg to the Atzmännig. Surprise someone special with delicious natürli products. Our gift boxes offer a variety of certified natürli Zurich Oberland regional products in different variations. A journey into the realm of dinosaurs. Information regarding spinning mill museum, weaving machine collection and industrial ensemble at Neuthal close to Bäretswil. The sewing machine museum exhibits several hundred historic sewing machines. The Eastern Switzerland magazine for leisure and mobility published by Thurbo regional railway – a Swiss Federal Railways company. Tips and useful information about the area around Winterthur. The regional season pass for lakeside bathing facilities and pools in the Zurich Oberland.